There&apos;s no doubt that Taylor Swift is one of today&apos;s most popular and talked-about pop, rock and country music stars. And there&apos;s no doubt that PNC Arena has hosted many of the hottest musicians in history, and has also impressed thousands of Music Maniacs with its superior design and sound. 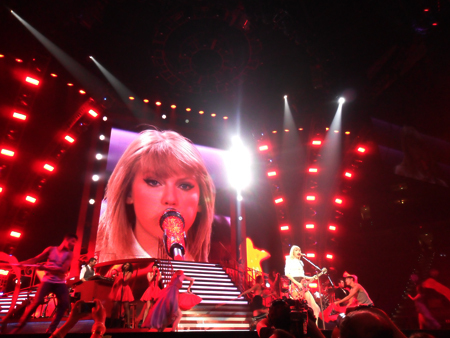 Fri. night, six-time Grammy-award winner Taylor Swift&apos;s "wow"-factor Red Tour, her fans and the 20,000-seat PNC Arena collided. The connection produced an unforgettable night of live music that will go down as an exceptional highlight in Greater Raleigh&apos;s live music history. I&apos;ve seen stellar concerts at PNC Arena from Billy Joel to Katy Perry, and there&apos;s no experience like seeing your favorite artists fill a 700,000-sq.-ft. venue with their stellar live shows. On top of the massive setting and big sound, even as Taylor Swift said herself Fri. night, crowds at shows in N.C. are some of the loudest, craziest and most wonderful. 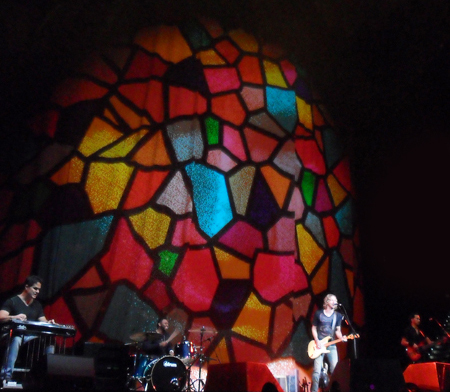 There&apos;s no concert experience like a concert experience in N.C. and in Greater Raleigh. Fri. evening, I made my way to PNC Arena as early as possible to soak in the scene. 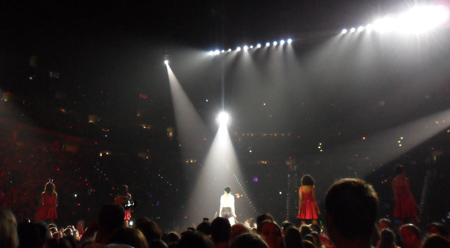 I saw that crowds of Taylor Swift&apos;s fans had already arrived donning red clothes, in spirit of the Red Tour&apos;s red theme. And since the arena permits tailgating, I heard fans blasting Taylor Swift&apos;s tunes from their vehicles and I could smell grilled hot dogs and hamburgers in sections of the parking lot (see PNC Arena&apos;s policies for more information on tailgating at the venue). But as the show&apos;s 7pm starting time drew nearer, Taylor time drew nearer. The arena filled with fans. 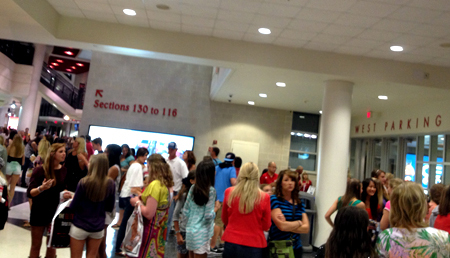 I love the arena&apos;s design as even at sold-out shows, like Fri. night&apos;s, the concourses never feel cramped. There&apos;s plenty of space to shop for tour merchandise and to grab a bite to eat. A nice variety of food and beverage is offered with more than 50 outlets to choose from. 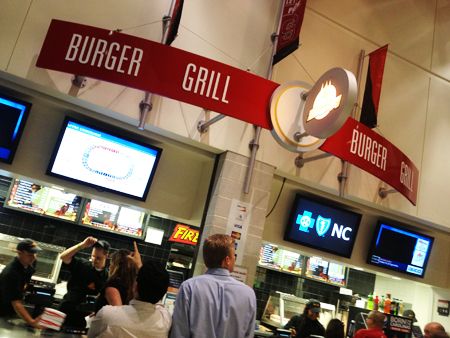 Fine dining is offered at the Arena Club Restaurant, perfect for dates, celebrations and more and casual dining is offered at outlets including N.C. BBQ Company, Fire It Up! Grill Stands, Market Place and more. Fuel up with delicious food and drink for a night of dancing and singing! Tour merchandise is always fun to shop, and sometimes tours even have special displays. Taylor Swift&apos;s Red Tour had displays showing off many of her outfits worn on awards shows, previous tours and music videos (her dress from the 2012 ACM Awards, her dress from the 2012 AMA Awards and the outfit she wore in the "Mean" music video and also during the Speak Now World Tour). When I made my way to my seat, friendly ushers and staff pointed me in the right direction. I&apos;m always impressed by the Southern hospitality and helpful nature of the staff at PNC Arena. And the noticeable camaraderie between its staff creates an even more positive, family-like atmosphere where you can easily feel at home. The concert kicked off right at 7pm with Casey James, known for his American Idol days and for his singles including "Crying on a Suitcase" and "Let&apos;s Don&apos;t Call It a Night." Casey James&apos;s voice and his deep, warm Fender Stratocaster sounds rang through the arena along with the sounds of his full band, which included a pedal steel player on a Mullen pedal steel, a drummer, a keyboardist and a bassist. Being the Music Maniac that I am, I was intrigued by Casey&apos;s slide guitar playing when he rocked his electric resonator guitar for his song "Drive." 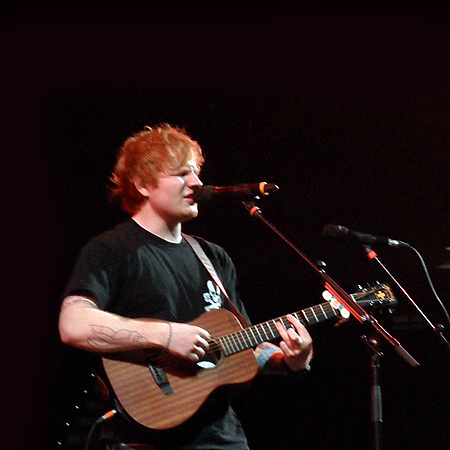 After Casey James&apos;s set, the stage was set for singer and songwriter Ed Sheeran, known popularly for his hit "The A Team" and virtuoso songwriting skills. 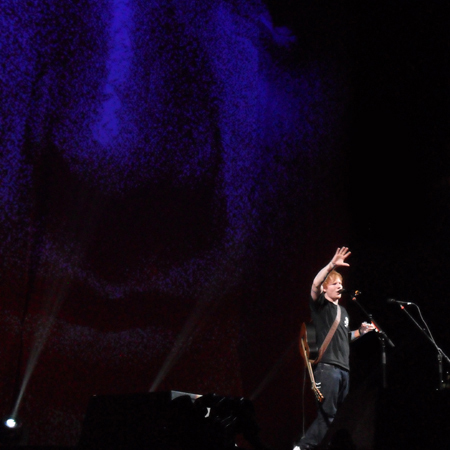 No band or accompaniment was present for the set—just Mr. Sheeran, his guitar and a loop pedal. 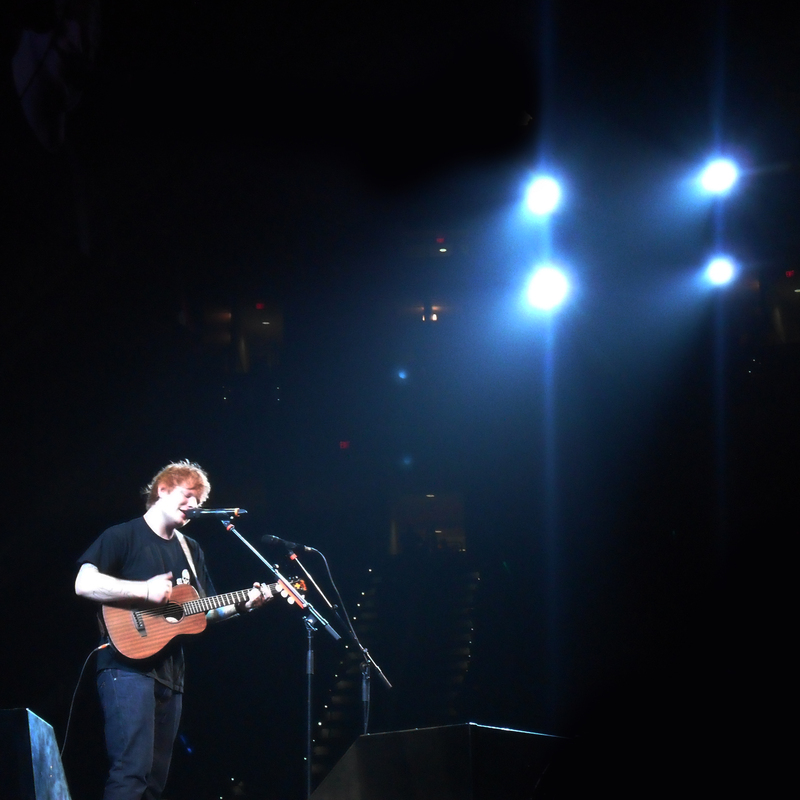 With the acoustics in the arena and the fullness of his playing and sound, Ed Sheeran filled the entire venue with his full voice and guitar, playing on his Martin LX1E electric acoustic. Ed Sheeran laid out percussion parts and beats on his guitar and used his Boss loop pedal to loop the beats, which made it sound like there was a full band on stage. With the arena&apos;s enormous sub-woofers and sound system, when he hit his guitar in the right place, it sounded like he hit a bass drum. At one point, he explained to the audience how his loop pedal worked. He connected greatly with the audience so when he urged the audience to sing along, the fans followed and the audience became a chorus, which sounded beautiful throughout the arena. He also mentioned the great time he was having in Raleigh! 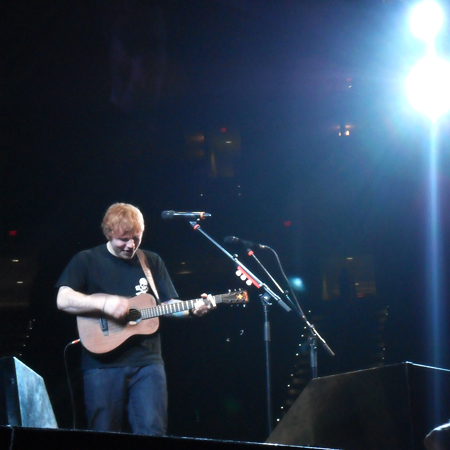 Ed Sheeran played songs including "Give Me Love," "Lego House" and "The A Team." Soon after Ed Sheeran&apos;s satisfying and entertaining set, the moment came that the Taylor Swift fans had been waiting for. The massive stage was completely set for Taylor Swift&apos;s production and energy was buzzing with everyone&apos;s eyes fixated on the stage. Lenny Kravitz&apos;s rendition of The Guess Who&apos;s "American Woman" began to blast through the venue&apos;s sound system (appropriate as Tom Petty&apos;s "American Girl" was the song played right before the 2011 Speak Now World Tour shows) and upon ending, in capital, red letters, the word "RED" appeared on the screens on the stage. The crowd erupted in screams and cheers. The screens lifted into the air and Taylor&apos;s silhouette could be seen on a massive red drape hiding the majority of the stage. 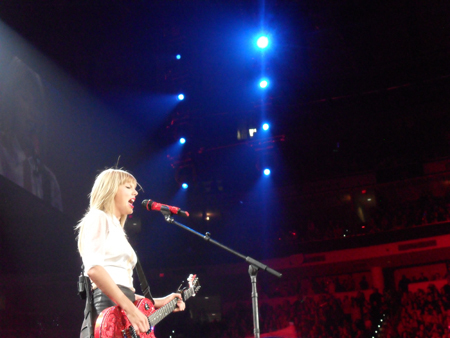 The drape fell and the cheers grew louder as Taylor appeared. The first song started and she made her way down the stage and to the catwalk that extended into the middle of the arena floor. Taylor Swift kicked off the night with her song "State of Grace" and went into hit after hit, the crowd screaming and singing along to each song. Her production filled the entire arena, with a main stage with the catwalk, a stage she performed several songs near the back of the arena (including a duet with Ed Sheeran on their hit single "Everything Has Changed"), a "floating" stage that "flew" through the arena and more. 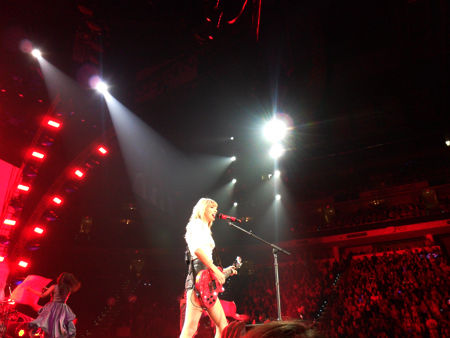 PNC Arena was the perfect fit for a production like this, with its four-level seating making every one of Taylor&apos;s stages easy to see. Throughout the night, Taylor went from full band, to solo, to parts where she explained the meaning of the songs she was about to play. Throughout it all, she created an intimate setting where she could connect with her fans. 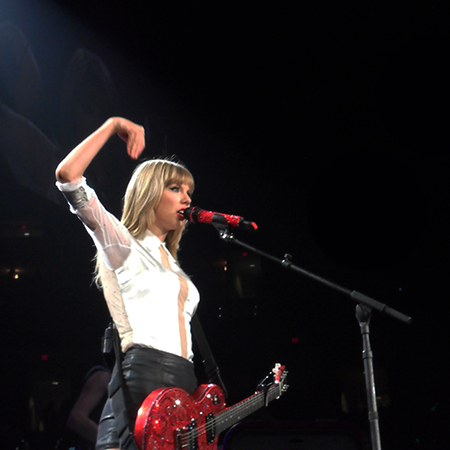 She would reach into the audience to shake her fans&apos; hands and give Red Tour guitar picks to them. And before one of her songs, she sat at her red piano and explained to the audience her passion for writing lyrics that she genuinely feels, and that she&apos;ll sometimes writes songs between the hours of 2am and 5am about deep emotions and thoughts. Each song featured a theatrical, visual theme, with one song having almost a "Nutcracker" theme with the dancers dressed as life-size, wind-up toys that entered the stage from a giant, old-fashioned toy box. Another song featured a masquerade ball theme. The concert ended with "We Are Never Ever Getting Back Together" as Taylor Swift, her band and her dancers rocked circus-themed costumes with Taylor appropriately dressed as the ring master. Confetti flew threw the air, dancers walked about on stilts, Taylor wailed with beautiful vocal runs and high notes and the song was even extended as the closing number came to an end. The arena, the concert, the artists, the fans, the atmosphere and the sound all created an unforgettable night of live music. PNC Arena is a place where you can experience artists bringing their theatrical visions and dreams to life all while filling the arena with their music. And you&apos;ll always feel the Greater Raleigh vibe at concerts at the arena with the staff&apos;s Southern hospitality, N.C. barbecue to dine on, fun Southern energy and North Carolina State University and Carolina Hurricanes NHL hockey team visuals throughout the venue. Check out the upcoming shows and events coming to PNC Arena here, including Michael Bublé, Macklemore & Ryan Lewis, Justin Timberlake and more. With the tremendous amount of live music events going on, Greater Raleigh has the most live music out of any destination in N.C. Check out the live music calendar at visitRaleigh.com to start planning your music-filled getaway.